Socks and Puppets, the comic » 590 – Snaaaaaaake! 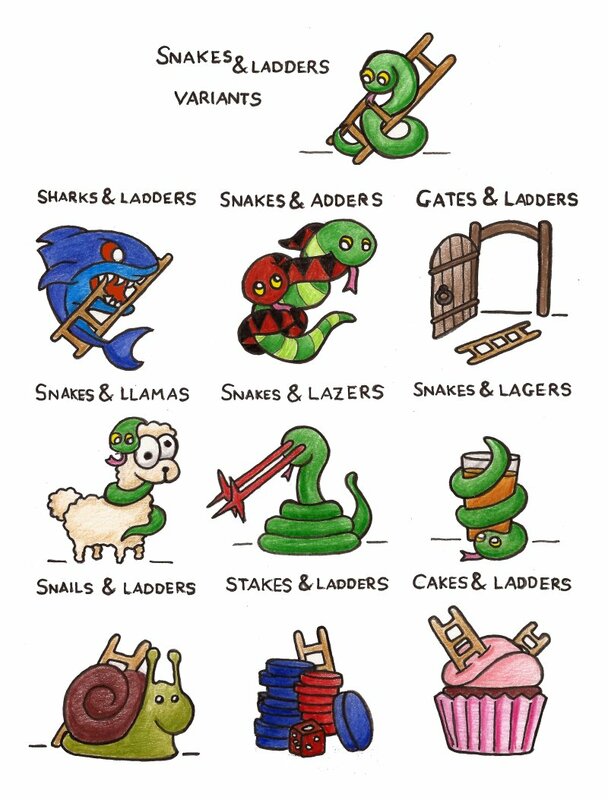 Also known as Drakes and Ladders, Snakes are replaced with Sharks. Landing on a Shark results in losing the game immediately. Games tend to be short and have no winners. Replace all Ladders with Adders. Adders work exactly like Snakes. Ladders connect each section of the board. Sections are bounded by two impassable gates which reverse your direction when reached. Replace Ladders with Llamas. Landing on a Llama allows you to pick it up, and cancel out the next snake you land on. This is a roborally variant, where the snakes have lasers that fire each turn. Avoid. Also known as Snakes and Bladders. Remove all Ladders. Landing on a Snake gives the player a choice between using the snake, or having a drink. The player loses if they need to take a bathroom break. Replace Snakes with Cakes. If you land on a cake space, you may eat the cake. You may not take turns until you have finished the cake.